In her first major solo exhibition in the UK, Mumbai-based artist Shilpa Gupta uses an eclectic variety of media to explore some of the themes most central to her work: namely, censorship, the particularities of text and script as tools of communication, and individuality versus collective experience to name but a few. The exhibition is titled Someone Else, after the work showcased in the first floor gallery. 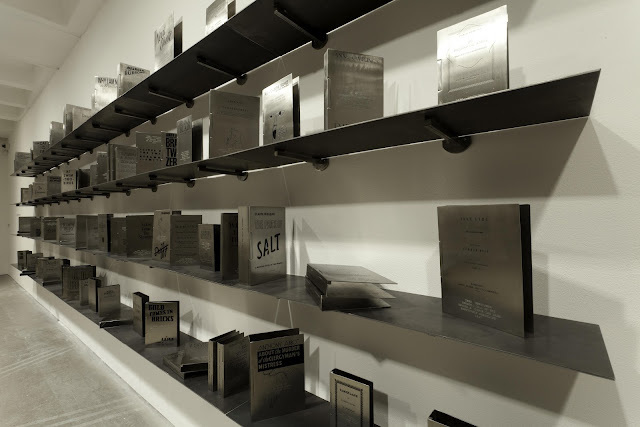 The installation comprises roughly a hundred metal cases in the shapes and sizes of various books published under a pseudonym, with an etching of the first edition cover, on which is added the writer’s reason for not publishing under their own name. The reasons are not surprising in and of themselves (‘fear of disrepute’ and ‘fear of disapproval’ are encountered in various guises, including but not limited to parental, societal, or professional). What is surprising, however, is how diverse the permutations of said reasons are, and the similarity of factors influencing the decision to opt for a pseudonym across the borders of gender, history, or socio-political circumstances. The cases are empty, the exhibition guide informs us, ‘to signify the absence of the author’s real identity’. And yet, the work does not seem to be correlating the use of pseudonym with the absence of ‘real’ identity, but seems rather more concerned with exposing the fact that a name is as arbitrarily connected to a work as language itself is to the world it purports to express and signify. Someone Else suggests that, whatever the name on a cover a book, the writer him-/herself will be judged according to the book’s content: the pseudonym may act as a temporary buffer, but it is the work that eventually will be the author’s legacy, and the measure of his or her ‘true’ identity. The question ‘Who was the ‘real’ Eric Arthur Blair?’ is not nearly as significant as the question ‘How correct was the author of Nineteen Eighty-Four in his vision of a future dystopia, which is our present reality?’ –and, by extension, where is this author situated in the current socio-cultural landscape? In the main gallery of the second floor, Singing Cloud moves away from the examination of identity and individualism towards a more collectively formulated experience. Made up of 4,000 microphones that have had their function inversed, so as to emit rather than record sound, the work pulsates and sings in a variety of voices and sounds, ranging from the beating of bird wings to snoring, to a chanting chorus of women, to the sound of a lonely piano key being hit again and again. The sounds are gathered up in the same way moisture is gathered in a cloud, eventually reaching a crescendo that reverberates through the work which then falls momentarily silent –in much the same way as a raincloud would reach saturation point and subsequently dissolve into rain. Singing Cloud acts as the embodied metaphor of the overarching experience of human life, transcending the boundaries of time and place and gathering disparate elements together in a harmonious whole. The two works showcased in the smaller space adjacent to the main gallery simultaneously bring together and juxtapose the concepts of individuality and voicelessness, community and discord. Untitled is a series of photographs in which the artist, donning combat trousers, khaki t-shirt, and military cap, poses in turn with her hands over her eyes, ears or mouth; another pair of hands (belonging to an invisible person behind her) furthers the isolation by covering the artist’s ears when her own hands cover her eyes and so forth. A sinister dimension of the theme of ‘see no evil, hear no evil, speak no evil’ is thus exposed: you’re hardly ever on your own when making the decision to look away, to keep quiet. More often than not, as Untitled shows, there is someone else there, pulling the wool over your eyes and making sure your ears will stay shut to the world around you, someone who puts their hands over your mouth if you even think about screaming to wake everyone around you up. There is No Border Here is a work made of pieces of narrow yellow tape, on which the words THERE IS NO BORDER HERE repeatedly appear, stuck together in the shape of a flag. The stripes of the flag bear lettering, a poem narrating the futile attempts to divide the sky, ‘one [half] for my lover and one / For me’. The attempts are futile because the clouds will stubbornly resist such divisions, passing from one side to another and back again, refusing to be pushed or kept away, ignoring the sofas, trenches, and other ludicrous measures of the speaker. Perhaps a haunting reference to the Partition of India and the subsequent exchanges of population and ensuing disputes, the work equally acts as a signifier for any conflict brought about and enforced by division. Denouncing as it does the absurdity of manufactured boundaries, (examples of which abound in contemporary society), There is No Border Here is a wistful hope and a stern reminder of the duty all peoples have to resist letting walls come between human beings. Someone Else offers a wonderfully articulate study of the inevitable interdependence between the individual and society, between the enforcement (or elimination) of boundaries and the formation of identity.